Thanks for the past 10 years! So this tax season was a little more challenging than anticipated; thus the reason this post is coming out in October. Needless to say, back on September 14, 2005 Wilson Rogers & Company came into existence. That means that 2015 marks 10 years of us being in business! A lot has happened in that time frame. So with this post, we thought we would not only recap our history, but just how we were able to make it that long. 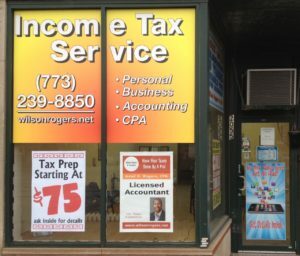 So after years of Jared getting “hey, your’re an accountant, I have a tax question for you.” he and Aaronita Wilson decided to start a tax company. “What are we going to call it?” was the question for a while. “How about we call it Rogers Wilson” Aaronita would say. “Nah, how about Wilson Rogers?” Jared replied. “Kind of sounds like a person. Some estately dude on a horse playing polo. It also sounds like another tax company we know…” And with that, Wilson Rogers & Company took form. Mr. Asberry becomes “client number one” by sending us his information. Mr. Simpson becomes the first transmitted return as he was quicker to process than Mr. Asberry! Jared and Aaronita get married on September 22, 2006, thus effectively removing a person named “Wilson” from the company. Don’t worry, people still ask to speak to Wilson Rogers when they come to the office! These were the “slow years” for the most part as there really wasn’t much that changed. Client levels stayed pretty consistent and revenues were largely flat. This was primarily due to the fact that both Aaronita and Jared maintained full time jobs within Corporate America. This would start to change in the following year. Sometime towards the end of 2011, the decision was made that Jared would leave Corporate America to head up our first “retail” office. Up until this point, all the tax returns were done “in house” by making appointments to pick up documents, preparing the returns at night and then providing the completed return to the client at a later date. 2011 was filled with decisions about health insurance, resignation dates and how to outfit the new office. Somehow, someway, it all managed to come together. Tax Season? Ready, Set, Go! Mr. Campbell had the honor of becoming “retail client number one” on a cold day in January. 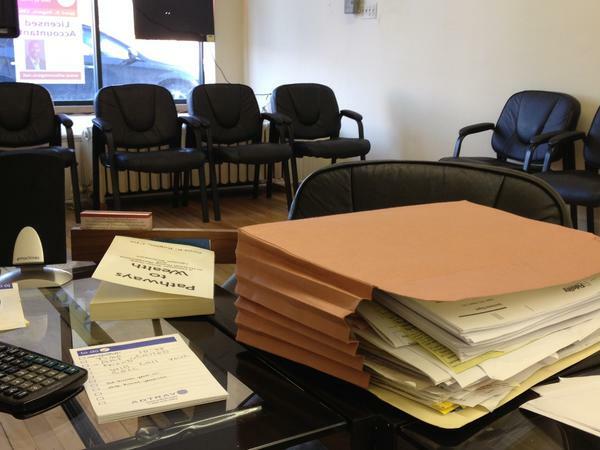 He had all his paperwork…we didn’t have the nice frilly folders to give him his tax return in. Oh man…the early days! At the same time we were opening the office, Jared was moonlighting with the fine folks of Intuit with their Turbotax Ask A Tax Expert (ATE) team. It was also the year that he broke the wrist on his dominant hand and had to finish out tax season using his left hand. Talk about bad handwriting! So we survived another retail office tax season. That recap can be found here. The one standout item for this year was that Teaspiller was purchased by Intuit and folded into the TurboTax brand. 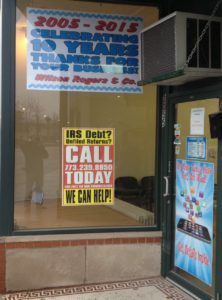 What that did was drive additional tax preparation business to us that was above and beyond what we had projected. It also continued Jared’s relationship with Intuit, which further broadened in late April when he became certified as a Quickbooks Proadvisor. This was the year that we hired “employee number one” so that Jared could have a little help. You can read all about Stephanie in a little interview that we did here. If you want to read about the season, that is located in this post. That post will also talk about how we began using bus benches to advertise to local traffic in our area! This was our fourth tax season with the office, and man did things really pick up. They picked up so much that we hired Patricia as “employee number two” to keep up with things. This was also the year that we launched www.fileoldtaxreturns.com to offer those needing to file older tax returns an option to do so. How Did We Survive 10 Years? Provide good service. If you don’t do that, you’ll be lucky if you last beyond a year. Value your customers. We have wonderful customers and we try to let them know that as frequently as possible. Without them, there would be no Wilson Rogers & Company. Stand out from your competitors. We’ve all heard that insanity is defined as doing the same thing over and over and expecting a different result. If you look, sound and act just like your competitors, expect to get their results – average! So be bold. Do things differently. Give the public what they want, not what YOU think they want. Make adjustments when necessary. Getting to 10 years has not been a straight line drive. We’ve had to adjust and pivot along the way. Have we made mistakes? You bet! Have we learned from them? Continuously. The key is to make adjustments when needed, forget the past and try to do better in the future. If you can do that (combined with the above points), then maybe one day we’ll be reading about how you survived your first ten years. Here’s to a bright future! This entry was posted in General Ramblings and tagged bus bench advertising, file old tax returns, file old tax returns turbotax, how to stay competitive in business, how to stay in business, Intuit Turbotax Ask A Tax Expert, Jared Rogers Bus Bench, jared rogers cpa, Jared Rogers Quickbooks Proadvisor, Marketing Your Tax or Accounting Business, My time as a TurboTax Ask A Tax Expert, our first tax season, our fourth tax season, our second tax season, our third tax season, Teaspiller, Top 5 Reasons Businesses Fail, TurboTax CPA Select, TurboTax Personal Pro, wilson rogers & company history, www.fileoldtaxreturns.com on October 19, 2015 by Administrator. No, we can’t finish your return before the 15th! Delivering excellent customer service. One of the ways in which we try to different ourselves from our competitors is by focusing on our relationships with our clients. We have always sought to treat our customers like they were members of our family and make it a point to deliver excellent customer service. We think that this must be working pretty well as we received 30% of our client growth from existing client referrals. Leveraging free advertising. Our company uses social media, posts ads in places like Craigslist, has profiles on platforms such as Yelp, Bing, Google etc. What’s common about all of the above is that is cost us nothing more than a few minutes of time to set up and maintain. Yet each one of these platforms more than pays for itself in that it brings us at least one new client per season. With that being said, we think we’ll continue to make sure our presence is felt out there in the internet ethos. Deepening our partnerships. In 2012 we had a few independent sales reps who helped promote our brand. In 2013 we increased that number to around 6. Each one of these individuals helped us significantly expand our presence and was responsible for a fair amount of growth. Likewise, we forged another partnership in early 2013 with a 3rd party that drove significant business to us this year. We look forward to continuing all these relationships next year. Marketing that isn’t working. Each year we test out some things to see if we can get an edge on our competitors. Some of it works and some of it doesn’t produce much of anything. The key is to be able to track what a marketing piece is doing so you can know what should be retained and what needs to be scrapped. With that being said, we’ll probably shift some of our dollars out of print, organizational and media advertising. We have some ideas of what we want to test next; such as Jared Rogers’ mug on a bus bench or big billboard on the side of the highway so stay tuned! Aspects of our client relations program. Existing clients are how we generate a lot of our new business. Thus, it’s pretty important that we engage them on a regular basis. But when certain things don’t yield the engagement or interaction you would like, then maybe it’s time to shake things up. On this front we’ll probably modify our newsletter program and reduce the frequency of it. In its place we plan to increase some of the other ways we “touch” our clients such as birthday cards, holiday correspondence, biannual client calls and increased classes/workshops. Our commitment to working smarter. One of the epiphanies we had this season was how much more lucrative it was to work with our corporate clients on a revenue per hour basis. Jared has a pretty good background working with Partnerships and S-Corps, which in turn sometimes have problems because they weren’t set up correctly. To that end, the firm may make a switch to more actively seeking these clients as opposed to individuals. While this doesn’t mean we’ll abandon taking on individual tax clients, it does mean that we will place some marketing efforts towards attracting more corporate clients. Hey, if you can make 3 times as much revenue in the same amount of time, doesn’t it make sense to work a little smarter? 2014 will mark our 3rd season with the retail office and we are truly hoping that it is more successful than our wildest dreams. To that end, keep your eyes peeled as we’ll be making many of those adjustments noted above in the coming months. How knows, maybe next year we can exceed the growth we achieved in 2013. If that happens, we think we’ll need to start hiring some more folks before Jared collapses from exhaustion! 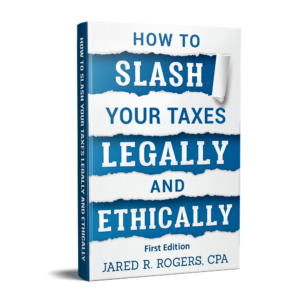 This entry was posted in General Ramblings and tagged how to grow your tax business, our 2nd tax season, our first tax season, our second tax season, our tax business grew, we grew our tax business on April 30, 2013 by Administrator.